An hour later, after breakfast, Tian Qiuxiang sent her son to kindergarten and went back home, put on her uniform and drove to the farm in a minibus, the oldest among the three cars she has. Tian cut the vegetable growing on the farm, bundled them, put them on the minibus, and drove to a hennery where the vegetable would be chopped up and mixed with soy bean meal to feed the 100,000 chicken. hennery would bring her an annual income of more than 200,000 RMB. This is more than 10 times her income when she was a migrant worker. Living in a villa and running her own business is something that is beyond the imagination of this woman ten year ago when she was an ordinary migrant worker on the assembly line. Ten years ago, Tian Qiuxiang’s life is filled with anxiety, bewilderment and uncertainty. With old houses and muddy roads, her home village was poor and backward. Like her fellow villagers, she went to the city to work as the income from farming could hardly make ends meet. Leaving her daughter at home, she moved from one factory to another, feeling isolated and helpless in the cities with splashing buildings. During festivals, seeing urban families sitting together, laughing and talking, she couldn’t help thinking: how can I live like this? What can I do to make life a little bit different? It was until 2008 when Tian Qiuxiang sensed the chance for “change”: CR decided to start the Hope Town Project in her hometown to aid social and economic development in the local area in response to the call of the Central Government on “promoting agricultural development with industrialization and driving rural economy with urban resources”. “Unlike my fellow villagers, who had no idea of what CR is, I know that it is a reliable big company as I always see Vanguard in the city where I work. So I decided to go back home to have a try”, said Tian Qiuxiang. Tian Qiuxiang, who was eager to improve her financial status, started to raise pigs before CR programs were implemented. But a big challenge emerged several months later – Tian had no idea of how to sell the pigs as she had no experience doing business. When she was about to give up, CR Hope Town Project Team lent a helping hand and helped her to sell all the pigs to CR Ng Fung. “I made at least 2 RMB/kg from selling pigs”. It was the first time for Tian to taste the fruit of success. With increasing trust in CR, she began to raise chicken under CR’s advice. But other villagers were not as bold as her as they had no capital, no technology and no sales channels. Faced with the situation, CR promised to subsidize 10 RMB to farmers for every chicken they raise, invited experts to offer trainings and technical assistance and helped farmers to sell the products on the platform of CR Vanguard and CR Ng Fung. However, CR believes that what’s more important than providing financial and technological aid is helping local villagers to unleash their own potential. Therefore, CR not only emphasized improving the capability of farmers but also focused on changing the mentality of farmers. 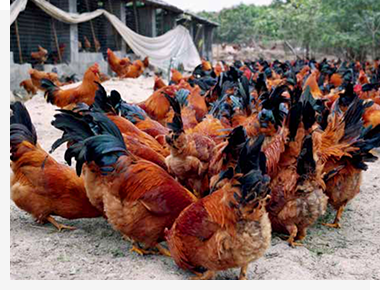 In early 2012, CR helped Hope Town to establish a chicken-raising cooperative. Tian Qiuxiang voluntarily became the chief technical officer of the cooperative, providing technical support to other farmers for free. Soon, warm-hearted Tian Qiuxiang became the most popular person in Baise Hope Town, attracting villagers from neighboring villages to ask for help. Besides, Tian Qiuxiang was elected as a deputy to the People’s Congress and proposed the problem of the education of left-behind children to Vice Premier Wang Yang during the Videophone Conference of the First National Poverty Alleviation Day in 2014. The Baise Uprising 90 years ago was the first attempt for the older generation to implement reforms in this region. Now, 90 years later, CR donated Hope Towns, initiating the second wave of reform in the region. The former allowed Chinese people to have their own land while the later filled the land with hope. Wide cement roads soon replaced the old bumpy, dusty road; children are reading English texts in modern, bright classrooms and old small houses are replaced by western-style villas. CR’s investment enabled local residents to enjoy all modern public facilities as urban residents do. In fact, rural areas riding the wave of the urbanization drive all over China have similar infrastructure, what’s the most valuable for Baise Hope Town is not the improvement of hardware, but the enrichment of the mind. Now, more and more young people choose to stay at home to make joint efforts for changes and allow everyone to benefit from the results of development as they are optimistic about the future and have their own beliefs. Now, Tian Qiuxiang would not have to leave her daughter at home. And has given birth to a son after coming back to her hometown. China has 900 million farmers. Driven by the wave of development and reform, a large number of farmers like Tian Qiuxiang was compelled to leave her hometown for cities, providing enormous impetus for rural construction with their own villages withering day by day, leaving only poverty to the next generation. CR always had the belief that in the time of changes, not a single farmer should cry. Agricultural prosperity lies a solid foundation for national development, rich farmers build a rich country and rural stability creates a safe society. Standing at the crossroad of the times, CR has been following the call of the central government to create a new path for farmers to regain dignity, a path full of hope. The story of Tian Qiuxiang is just an example of CR’s efforts to solve problems concerning agriculture, rural area and farmers. Since 2008, CR has built 9 Hope Towns, which are like sparkling fire igniting the light of hope all over the nation to make rural areas as beautiful as they used to be. From a migrant worker to a businesswoman with her own agricultural brand and deputy to the People’s Congress of Guangxi Autonomous Region, Tian Qiuxiang is just one of the thousands of farmers who changed their fate with the help of CR, a responsible central enterprise committed to improving the well-being of the public. With the philosophy of “being grateful and contribute to society”, CR has been actively carrying out its social responsibilities, fousing on social issues and making full use of its own resources to initiate campaigns to promote poverty alleviation and public welfare. Through developing Hope Towns and carrying out targeted poverty alleviation, CR was able to come up with the fundamental solution to “problems concerning agriculture, rural areas and farmers” to improve people’s well-being and realize the harmonious development of business and society. While seeking sustainable development, enterprises cannot grow without the participation and support of communities, and communities need the creation and contributions made by enterprises. CR actively responds to national policies and pays taxes according to laws and support communities; we continuously increase the level of safety management to ensure safety production; we focus on key issues in the social development and carry out poverty alleviation and volunteer activities with our resources and expertise to improve people’s livelihood. We are always grateful and give back to the society, we are devoted to make our shares of contribution to communities and ensure harmonious coexistence with communities.